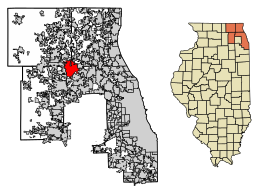 Location of Barrington Hills in Cook County, Illinois. Barrington Center Church was built in 1853 by the Barrington Methodist Episcopal Society. A memorial plaque outside the church lists 91 area residents - one woman and 90 men - who served in the Civil War. Since the 1980s, the church building has been used by a Korean-American congregation, the New Friends Wesleyan Church. In 1860, about 18 immigrant families of Czech ancestry settled along the east side of the Fox River, near the future site of Fox River Grove. 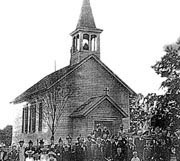 In 1867, land was purchased at the southwest corner of Church and River - Algonquin roads, and construction was started on St. John Nepomucene Chapel, named after the patron saint of Bohemia. Completed in 1873, the chapel was never served by its own priest, and currently services are scheduled only once a year. The chapel and its cemetery are owned by the St. John Nepomucene Catholic Cemetery Association, making it the only privately owned Catholic chapel and cemetery in the Rockford Diocese. Starting about 1900, business executives from Chicago, many of whom were tied to the railroad industry, purchased the rolling farms and subdivided them into large summer estates. One such individual was Spencer C. Otis, who by 1910 is credited with purchasing 1,000 acres (405 ha) of farmland along what was then Goose Lake Road but is now known as Otis Road and creating Hawthorne Farm. Otis was a "gentleman farmer" of the era. He worked in Chicago commerce, but his hobby was dairy farming on his large country estate. Several of his business associates, including George E. Van Hagen, also built large estates in the area and ran their summer homes as year-round dairy farms. In 1921, the Barrington Hills Country Club, with its eighteen-hole golf course, was established on 200 acres (81 ha) of unfarmable land between County Line Road, Oak Knoll Road, and Northwest Highway. The land was donated by three of the club's early founders: H. Stillson Hart, who owned the farmstead known as Hart Hills just to the east of the club; George E. Van Hagen of Wakefield Farm, who owned the land just to the west of the club; and J.R. Cardwell, whose Oak Knoll Farm swelled along the winding Oak Knoll Road on the club's northern end. Van Hagen became the club's first president. Noted Chicago architect Robert Work, who was associated with David Adler, designed the first clubhouse, which was opened in 1926 and burned to the ground in 1930. Work designed the second clubhouse as well, which opened in 1931 and still stands. The Grigsby Estate is on the National Register of Historic Places in Lake County. Barrington Hills was incorporated in 1957. It was then composed of land only in the northwest corner of Cook County, and expanded over the next five years to its approximate configuration of today. In 1959, areas in McHenry and Lake counties joined the village, and in 1962 the village of Middlebury in Kane County was annexed. With the incorporation of Middlebury, the village government acquired its first building, a single-room school house converted into a police station. The Village of Barrington Hills is a home rule municipality which functions under the council-manager form of government with a Village President and a six-member board of trustees, all of whom are elected at large to staggered four-year terms. The current village President is Martin J. McLaughlin. There are six current members of the Board of Trustees Colleen Konicek Hannigan, Bryan Croll, Michelle Maison, Brian D. Cecola, Robert Zuback and Paula Jacobsen. Officers of the village include a village treasurer, a village clerk, a building code enforcement officer and a village manager. The village manager is Anna Paul. The current Village Hall was constructed in 1974 with a substantial addition in 1993. The building hosts the Barrington Hills Police station, administrative offices and public meeting rooms. Barrington Area Council of Governments BACOG offices are also located on this site. A fire station was constructed in 1994 on the grounds. The only public school located in the village is Countryside Elementary School, with about 500 students, in grades K-5, in the Barrington Community Unit School District 220. Older students attend the nearby Barrington High School. Portions of the village are also within CUSD 300. Some families send their children to the private Elgin Academy. Barrington Hills is located at 42°08′24″N 88°12′12″W﻿ / ﻿42.14000°N 88.20333°W﻿ / 42.14000; -88.20333 (42.1399063, -88.2034182). According to the 2010 census, Barrington Hills has a total area of 28.039 square miles (72.62 km2), of which 27.43 square miles (71.04 km2) (or 97.83%) is land and 0.609 square miles (1.58 km2) (or 2.17%) is water. 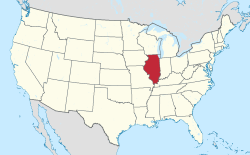 The village is located within the Fox River watershed of the greater Illinois River waterway. There is about 1,700 feet (520 m) of shoreline along the east bank of the Fox River. Locally there are two perennial stream courses known to the west as Spring Creek and to the east as Flint Creek. Over the years, Flint Creek has been impounded such that along its course in the Cook County portion of the village are substantial lakes with such names as Hawley, Hawthorne, and Keene. Into the 1990s, farmers still worked about 3,000 acres (1,200 ha) of land. Residential properties of over 1-acre (0.40 ha) covered 30 percent. There is no downtown center, but the village has a small shopping strip along Route 14. With a population of 4,209 in 2010, Barrington Hills has kept its rural flavor as industrial and commercial development has sprung up around its borders. The village is bordered on the west by East Dundee, Carpentersville, and Algonquin; on the north by Fox River Grove, and Lake Barrington; on the east by Barrington and Inverness; and to the south and southeast by South Barrington, and Hoffman Estates. Barrington Hills is one of only two municipalities in Illinois with land located among four counties. As of the census of 2000, there were 3,915 people, 1,381 households, and 1,168 families residing in the village. The population density was 140.4 people per square mile (54.2/km²). There were 1,456 housing units at an average density of 52.2 per square mile (20.2/km²). The racial makeup of the village was 94.30% White, 0.46% African American, 3.91% Asian, 0.74% from other races, and 0.59% from two or more races. Hispanic or Latino of any race were 1.92% of the population. There were 1,381 households out of which 33.6% had children under the age of 18 living with them, 78.9% were married couples living together, 3.5% had a female householder with no husband present, and 15.4% were non-families. 12.5% of all households were made up of individuals and 5.3% had someone living alone who was 65 years of age or older. The average household size was 2.83 and the average family size was 3.10. In the village, the population was spread out with 25.3% under the age of 18, 4.6% from 18 to 24, 20.0% from 25 to 44, 37.7% from 45 to 64, and 12.4% who were 65 years of age or older. The median age was 45 years. For every 100 females, there were 98.1 males. For every 100 females age 18 and over, there were 98.6 males. The median income for a household in the village was $145,330, and the median income for a family was $156,002. Males had a median income of over $100,000 versus $56,167 for females. The per capita income for the village was $73,629. About 0.9% of families and 3.1% of the population were below the poverty line, including 3.9% of those under age 18 and none of those age 65 or over. The village ranks 87th on the list of highest-income places in the United States with a population over 1,000, with nearby North Barrington, South Barrington, and Inverness also making the list. ^ "Geographic Identifiers: 2010 Demographic Profile Data (G001): Barrington Hills village, Illinois". U.S. Census Bureau, American Factfinder. Retrieved December 10, 2012. ^ a b "Barrington Area Cemeteries". Barrington Area Library. 2010. Retrieved 2 March 2010. ^ Schmitz, Patty Dowd (2007). A Club in the Country: The Story of Barrington Hills Country Club. Barrington Hills, Ill: Barrington Hills Country Club. OCLC 165274776. ^ Koziol, Ronald; O'Brien, John (28 May 1992). "Reputed Mob Boss Accardo Dead at 86". Chicago Tribune. Laborers International Union of North America. Retrieved 2 March 2010. Wikimedia Commons has media related to Barrington Hills, Illinois. This page was last edited on 10 February 2019, at 21:56 (UTC).